For some reason I knew the custodians were getting close to my room, so the last 2 days I put the "rush" on of cleaning it before they got their to clean my room for the summer. I cleaned things, threw away things, and of course brought things home for me to work on over the summer. One of the items that I got done today was my poem booklets for the entire year. I just threw the masters into the copier, selected back to back copying, and made 30 booklets. Of course, I am praying that I don't have 30 kids, but I am playing it safe. Once they were copied, I brought them home. I laminated the covers for them, binded them, and they are ready to take back to school tomorrow. I love putting things on my "finished" shelf. 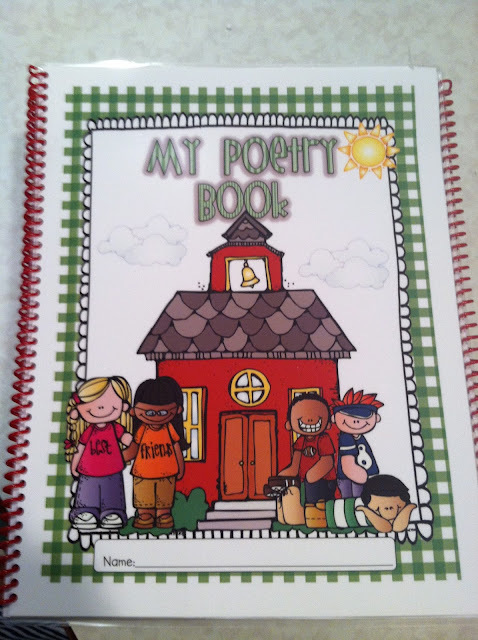 We just put our poem booklet on TPT for the first time. I have used a poem booklet for several years. We work on poems throughout the week. Then we read the poem, butter popcorn words with our highlighters, and then find hunks/chunks. Once we are done, the students illustrate the poem. If you would like a direct link to our poem booklets, click here to check it out. Here are some pictures that I took of the Poem Booklets. Here are the front covers of my poem booklets. I also used another cover on the inside that was for Nursery Rhymes. Sample of an October poem last year that we used. The kids loved this poem. 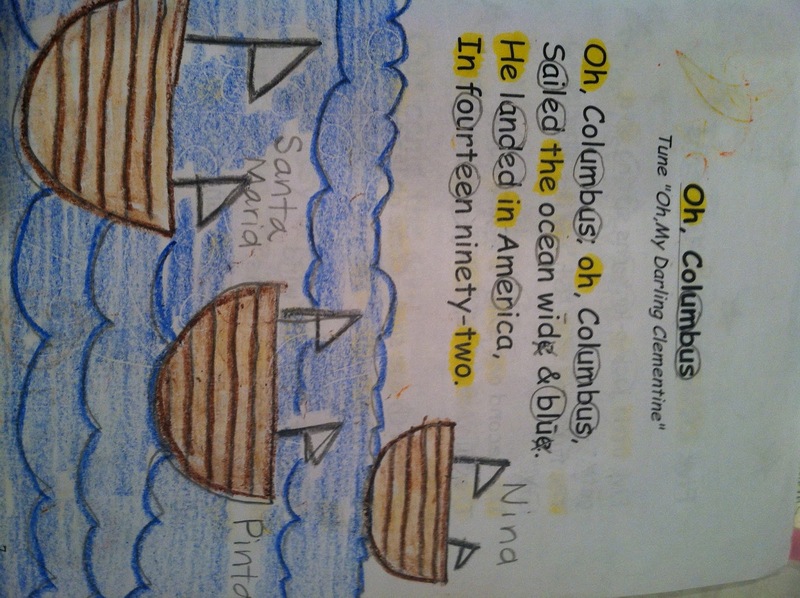 It taught them about Columbus Day and we hit many common core reading standards along with some social studies standards. 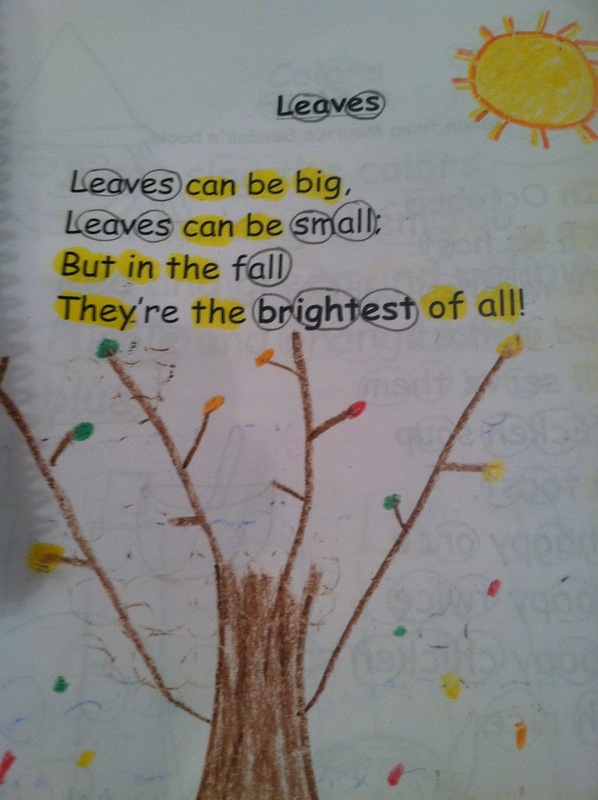 Another October poem that the kids learned about fall. I am so close to wrapping up my homework booklets for the entire year. SueBeth and I are going to put it on TPT real soon. I have my copies all finished, I just need to get a class list! Ha, ha!! Once I have a class list, I will put their names on the binder part of the 3 ring notebook. I fit a whole year in an 1 inch binder with plenty of room for other things. Each week, I rip out the old week and the new week is ready to go. Last year I didn't even open the binder, I just ripped out the previous week on Monday morning. It's a great feeling to have my homework booklets done for the entire year!! I did several choices for a front cover. I will use labels for their names once I get a class list. 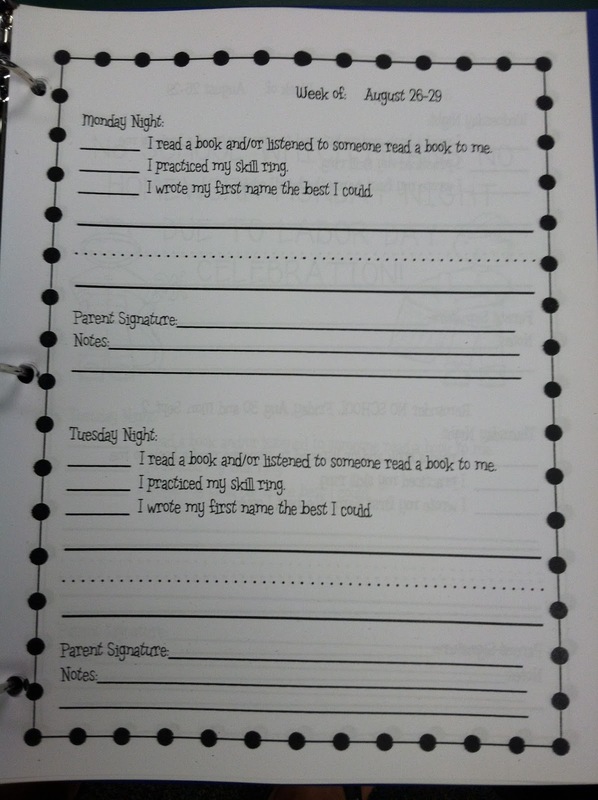 Sample from the first week I will be doing homework. It changes after 4 weeks to add some DIBELS components. This actually looks a lot thicker than what it really is since it is standing up. 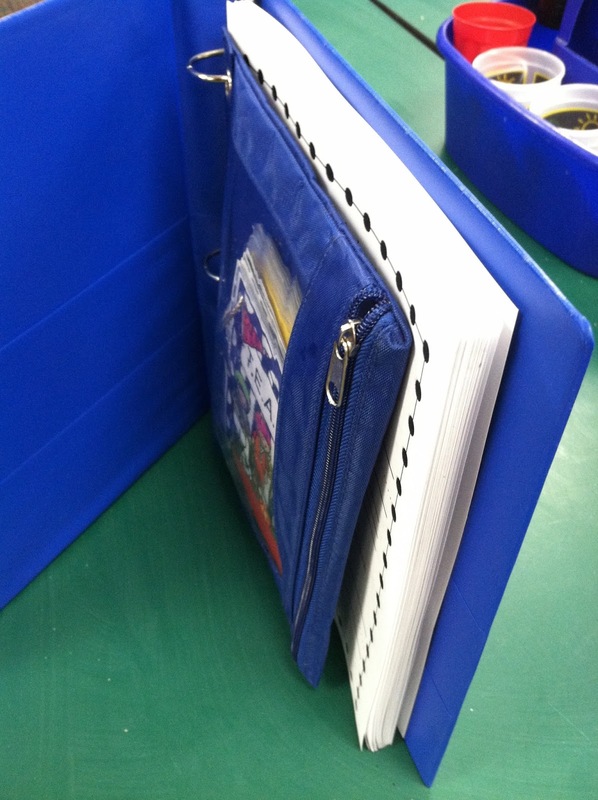 The entire year is in this binder. I ran it back to back and it's not that thick! Some additional pictures of some other phases that I am about done with for bulletin boards inside of my classroom. 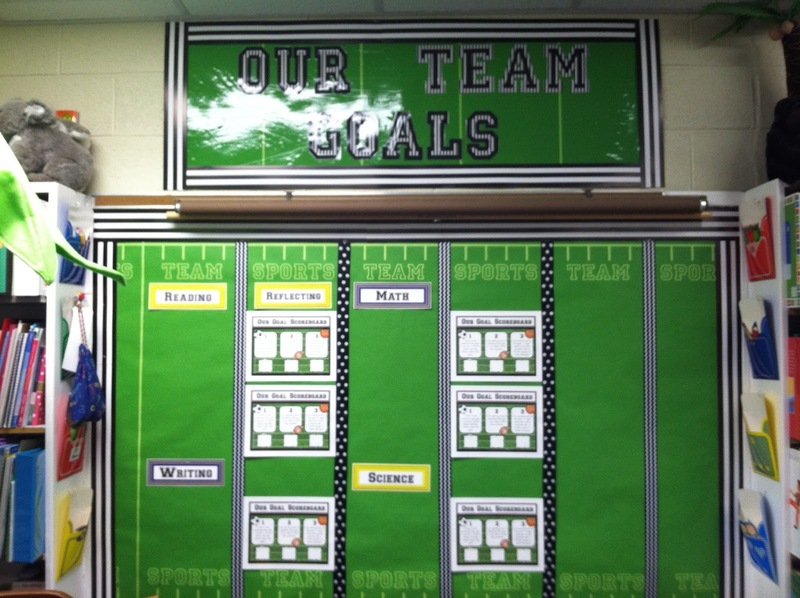 Here is where I will be posting my goals and reflections for the entire year. I decided this year just to do the goals that were on the grade card. This board is not done as I ran out of ribbon and I have to wrap up my goal sheets, and subject titles. 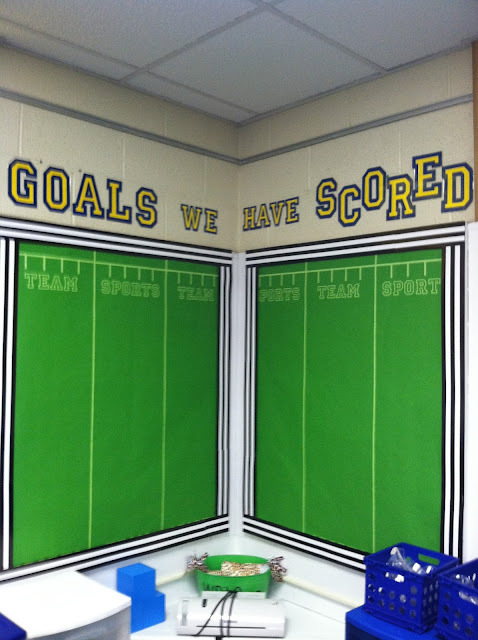 Here is the area that we are going to put goals that we have mastered. This board is almost finished too, just need some additional items. This board is done. Don't you love how simple my rules are for the entire year. Actually our whole school says this "phrase" each morning on our announcements. It's 3 easy things and if you think about it, every thing that a kid does "wrong" throughout the day gets covered by one of these 3 topics. Love it...short and sweet! The best part is they can say it day 1. Love your set up...Poetry book is amazing. It really challenged what I do with my kids. TOUCHDOWN!! You scored! Your room is awesome! I LOVE EVERYTHING! Can you tell me what clipart you used for your referee? Thanks! Aha! I found it! It is Melonheadz Illustrating and Doodles! VERY cute! Hi there!!!! Help!! 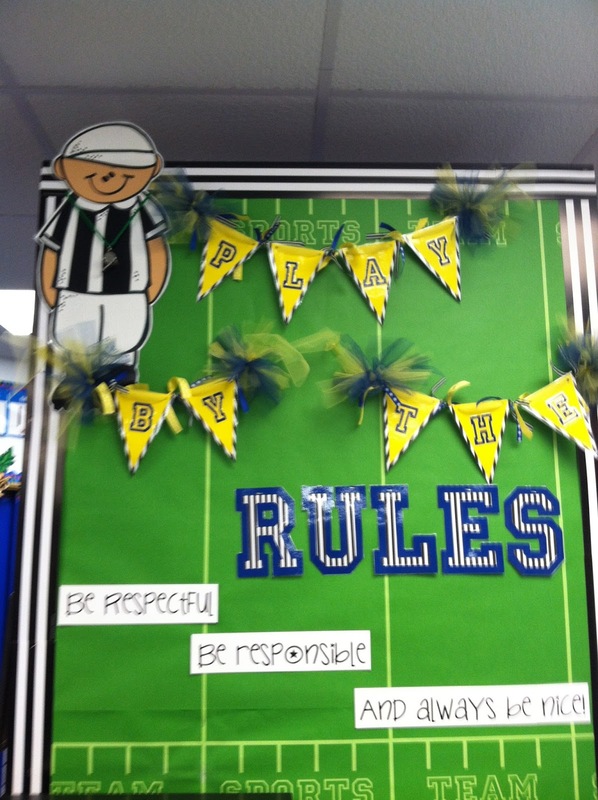 I am doing a Sports Theme in my classroom and I am wondering where you printed your bunting the said Play By The Rules!!!! 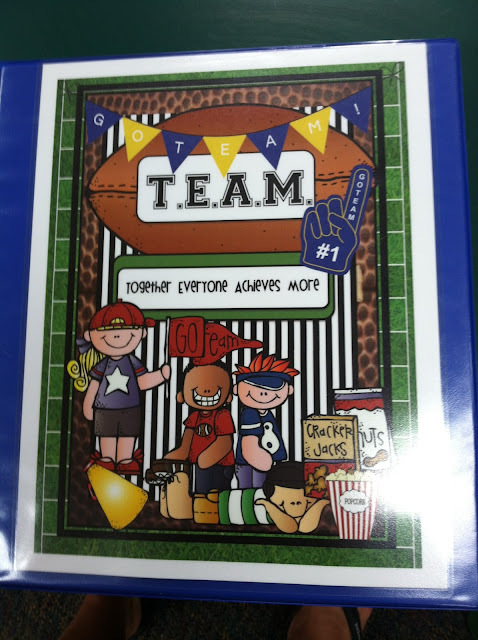 I want to do Tackling Calendar Math with a bunting nd football players!! That Referee is to die for!!!!!! Wow!!! Also are you selling your binder covers on TPT?? Would love to purchase those Sports themed!!! Thanks a bunch!!! How did you make your referee? Love this rules bulletin board!!! Is your background paper fabric or paper for football field? How did you do the pennants with the letters and the RULES letters? So cute! I love all your decorations. Can you tell me where you got them!!! How did you do the sports bulletin board background? Did you find special paper? It's adorable!! PLEASE! I would love to know where you get the clipart guys on the cover of your poetry books and the referee on your sports bulletin board. Please! I also love the referee! Where did you find it, make it, print it? I must have! Your bulliten boards are darling! Can you tell me how you made your "play by the rules" pennant flags and referee? Or are they resources you sell?